I have been using your TenFourFox browser on my Apple G5 and the website Chase.com continues NOT to render properly when visited. I have attached a screenshot for your review. Do you have any suggestions on how Chase.com can be properly viewed using TenFourFox? BTW, every browser version including the latest, 45.4.0, has the same issue. For some reason the style sheet doesn't load on your system. This might lead me to suspect one of your add-ons, if you have any installed. You might also see if resetting your profile fixes the problem (see "How to reset your profile" at lower right). 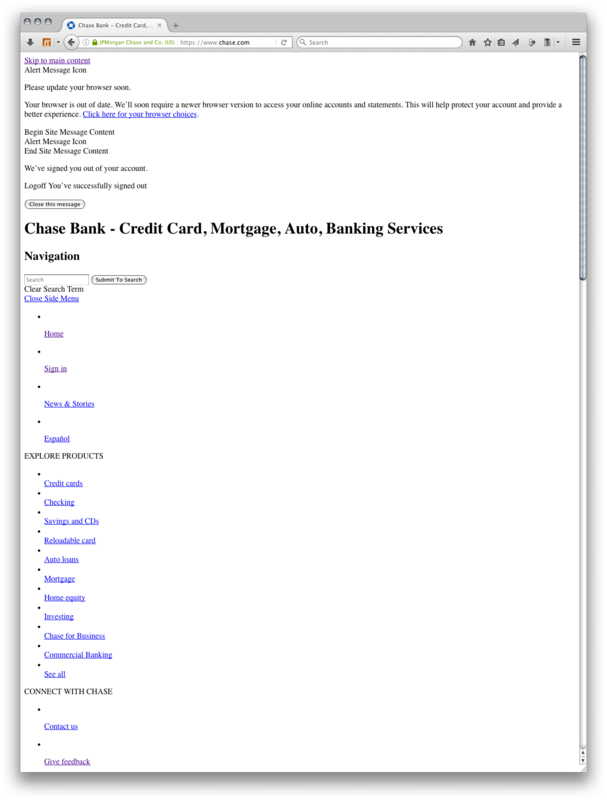 I'm a Chase customer myself, however, and the site loads fine and I'm able to access and pay my bills in it. You may need a workaround for the user agent such as https://tenfourfox.tenderapp.com/discussions/problems/8191-access-t... (search for "Chase" here to see other user reports) but that wouldn't be the cause of what you're seeing here. Your suggestion for me to reset my profile worked. Excellent. Please check out the other Chase discussions if you still have issues. I'll close this ticket. You don't need to reply. Any reply will reopen the ticket. Cameron Kaiser closed this discussion on 14 Sep, 2016 02:08 AM.